By breaking free from our misperceptions about what it means to be an adult, we can reshape our world and become harbingers of grace. By restoring the childlike ways of humility, trust, awe, wonder, playfulness and more, we can recover a fuller picture of what it means to be human. 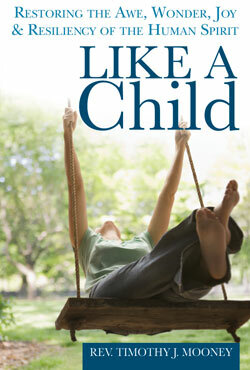 This unique spiritual resource explores what Jesus may have meant when he said, “Unless you change and become like children, you will never enter the kingdom of heaven.” It addresses our modern misperceptions regarding the nature of maturity and the common coping mechanisms—distrust, guardedness, insecurity, judgmental thinking—we acquire, and feel we require, in adulthood. Along with the wisdom of ancient and modern spiritual luminaries, this book provides over twenty-five spiritual practices to help us cultivate the childlike ways of attention, self-awareness, joy and resilience in our inner lives as well as in our relationships with others. The exploration of the possible meanings of this simple statement in a six-week sermon series, and the positive response by the congregation, spurred me to further reflection. What would it mean to become truly childlike? Why are these qualities essential for experiencing the realm of God’s grace? And how are we to cultivate these qualities so many adults—myself included—seem to lack? In my own life, and as a spiritual director and pastor, I began to see how important these qualities are to spiritual health and vitality, and their relevance to people’s lives regardless religious differences. What is the significance of the subtitle, “Restoring the Awe, Wonder, Joy and Resiliency of the Human Spirit”? The coming-of-age process tends to bury the unique selfhood of each person under layers of familial, cultural and religious expectations, roles and behaviors. The verb restoring points to my conviction that the cultivation of childlike qualities helps us remove those layers so that our true self and true community might emerge more fully. Restoring also moves us away from the notion of original sin and the self’s need to be saved from this life, and moves us closer to the notion of original blessing and the self’s invitation to live fully in the kingdom of God, which is present here and now in our midst. Awe, wonder, joy and resiliency are human birthrights, available to us even in the midst of life’s difficulties and tragedies. How have you been changed and challenged by writing this book? Writing Like a Child has changed my life in wonderful, humbling and unexpected way.! Each chapter invited me to look at the presence or absence of that childlike quality in my own life, and how to cultivate it and actually practice it. Writing the chapter “Reclaiming Beginner’s Mind,” for example, revealed just how often I refused to change my attitude, plans or internal thoughts—to my own detriment! And now that the book is written, I have been pleasantly surprised by how often my own words return to me in real-time situations and experiences. They remind me to find a way to trust myself and life when I’m fearful, to step back and take in the wonder and mystery of someone I have unfairly judged, to open my mind to different possibilities not considered and to get in touch with all of my emotions and desires so I can discern what is the heart of the matter. I have a feeling I will be learning to become childlike for the rest of my life! When you look over the chapter titles, which ones are you drawn to? Which ones would you like to avoid? Why do you think Jesus’s encouragement to “change and become like children” has not been explored to any great extent? How do you understand Tim’s comment that spiritual transformation calls for a fundamental resetting of perspective and vision? How does it feel to equate “spiritual maturity” with “childlike qualities”? What degree of trust do you have in yourself, others and God? What has caused you to not trust yourself, others, life or God? In what areas of your life are you being invited to trust more deeply? How well do you sit in the chair of your life? In what ways are you playing it safe? Where do you sense invitations to be wholehearted? What messages did you receive growing up about who you could and could not be? What are you discovering about yourself that needs to be lived out in your life? What might it look like to live closer to the truth of who you are? When was the last time you were filled with awe and wonder? What evoked this experience? What would it mean for you to let all of life be a sacrament? Through what lens do you typically look at life? Hopeful? Doubtful? Suspicious? Trusting? How has the way others see you affected you? In what ways are you being invited to see yourself and others without judgment? Bring to mind the last time you became upset. What deep desires or hopes were trying to be expressed in you? What emotions and desires are unacceptable for you to admit or express? How would you respond to Jesus’s question, “What do you want me to do for you?” What does that say about your deepest longings? What are your favorite routines? What routines of heart and mind feel like ruts? In what arenas of your life are you being invited to cultivate beginner’s mind and reimagine your life? How is your understanding of God and the spiritual life evolving? How is your sense of self changing? Describe an experience in your own life when you were forgiven. How did it feel? What did you learn? What past grudges and resentments are still active in you? Where do you experience them in your body? How has being unforgiving had an effect on you? What would it mean for you to turn your “rage into light”? How are you being invited to forgive yourself? Describe the last time your body was fully engaged in an activity. What did it feel like? What did you learn? In what ways do you allow yourself to be embodied? If your body could speak audibly, what would its postures, pains, desires and pleasures say to you? Recall the last time everyone had a good laugh at your expense. Could you laugh at yourself? Why or why not? What did you learn? What would your life look like if you took yourself less seriously? What do you make of Tim’s comment that play is serious business? What are your favorite ways to play? What do you get out of playing? How might you turn play into a spiritual practice? How might your spiritual practice become more playful? What are the differences between your “onstage self” and your “offstage self”? What are the different “selves” in you? What would it mean for you to accept all that you are? What denied part of yourself is hunting you down? How might you embrace that part of you? What old masks and roles are being stripped away from you? In what ways do they no longer serve you? What sense do you have of your emerging true self? How does it want to be expressed and lived? Which glimpses of yourself as a child reveal something about your true self? What would it mean for you to be more you now than ever before?